A printer is a type of eternal hardware output device which is responsible for taking electronic data that has been stored in a computing device and is utilised to generate a hard copy of the data. Printers are one of the most commonly used peripherals of computers which are used for printing texts and photos. This type of printer uses print heads that contain 9-24 pins. These pins produce patterns, dotted patterns on paper to create individual characters. The 24 pin dot-matrix printer produces more dots as compared to a 9 pin dot-matrix printer that results in a higher quality and clearer characters. The rule of thumb is greater the number of pins, the clearer letters on paper. The pins strike the ribbon individually since print mechanism moves across the entire print line in both directions i.e. from left to right, then right to left etc. 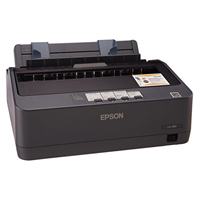 The user can produce a colour output with a dot-matrix printer (the user will change the black ribbon with a ribbon which has colour stripes). These printers are inexpensive and normally print at a speed of 100-600 characters per second. Daisy wheel impact printers have a print mechanism similar to a daisy. 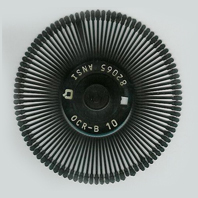 It is also known as daisy-wheel printer since the print mechanism is similar to a daisy. A character is created at the end of each ‘’petal’’ in order to create a solid-line print. A hammer hits the petal containing a character against the ribbon which the character prints on paper. It speed is usually 25-55 characters per second. In businesses in which a huge amount of material is printed, the characters at a time are printed very slowly. So, line at a time printers are necessary. They use a special mechanism which can print a whole line at once. They can normally print in the range of 1200 to 6000 lines per minute. Drum, chain and band printers are all line at a time printer. A drum printer includes a solid, cylindrical drum which has raised characters in bands on its surface. The number of print positions across the drum equals to the number available on the page. It is usually between 80-132 positions. The drum revolves at a quick speed. For each print position, there is a print hammer which is located behind the paper. The hammers strike the paper with the ink ribbon, against the proper character on the drum as it passes. One revolution of the drum is necessary for printing each line. Therefore, all characters on the line are not printed simultaneously. But the time needed for printing the whole line is front enough to call them line printers. The normal speeds of printers are between the range of 300 to 2000 lines per minute. A band printer functions in a way similar to a chain printer except that it utilises a band rather than a chain and has fewer hammers. A band printer is equipped with a steel band which is divided into five sections that have 48 characters each. The hammers on a band printer are mounted on a cartridge which moves across the paper to the suitable positions. Characters are rotated into place and are stuck by hammers. The font styles can be easily changed through replacement by a chain or band. A chain printer utilises a chain of print characters that are wrapped around two pulleys. As the drum printer, there is one hammer for print position. The circuitry within the printer detects once the correct character appears on the desired print location of the page. The hammer then strikes the page and presses the paper against a ribbon and character that is situated at a desired print position. The character leaves an impression on the page. The chain continues rotating till all the print positions on the line are filled. Then, the page moves up in order to print the next line. Their speed is normally between 400-2500 characters per minute. If you require a printer which produces rich, detailed graphics or fresh text documents, an inkjet printer would be ideal for you. These printers work by spraying minute ink droplets directly into paper. They are ideal for printing on different types of paper types and sizes like labels, business envelopes, scrapbooking paper ad labels. But, high quality printing requires variable print speeds. Therefore, this option is suitable for light printing needs that are used in homes and small businesses. 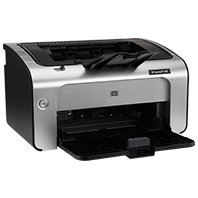 All-in-one inkjet printers offer a convenient way for accessing numerous devices in a single space-saving unit. 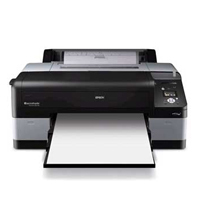 Inkjet printers available online are in two varieties- a 3 in 1 which enables you to print, copy and scan documents or a 4-in-1 which enables you to fax. 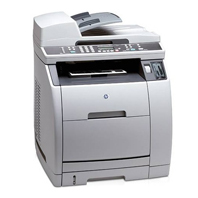 Laser printers are specifically created for printing large volumes quickly and are available at low cost per page. As in case of copy printers, laser printers utilise static electricity and toner powder instead of ink for transferring images and text into paper. Though high printing speeds and cost efficiency are the major advantages of laser printers, there are some other benefits also. Since the toner is already dry, you won’t have to wait for it to dry. It won’t smear on your paper. 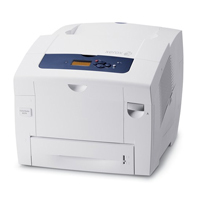 And if you are looking for versatility and convenience, opting for an all-in-one laser printer is a major option. Specialty photo printers are designed for creating high-quality photos which compete with the ones you acquire from a cyber café, at a comparable or lower cost. One of major plus points of a photo printer is the convenience of printer photos immediately, without the hassle of making a trip to the store or waiting for them to appear on your email. 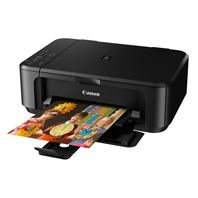 Photo printers enable you to print directly from a well-matched camera through a PictBridge (a special type of USB coaction). Some photo printers also accept SD cards, CompactFlash or memory sticks. Many models even let you perform editing right from the printer such as red-eye removal, cropping etc. From printing 4’’x6’’ photos, pictures for scrapbooking, CD and DVD covers and much more, you can prove your creativity using a photo printer. What Are the Different Brands of Printers? 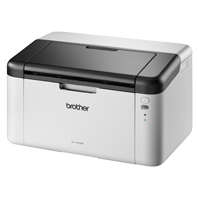 The Brother printers that we are offering as a part of our collection include models that operate using monochrome technology and GDI emulation. Our monochrome and operates using electro photographic LED (single pass) technology. The monochrome printers have a high copy speed and can be used for printing posters, booklets and papers. The Canon Printers that are available at Moglix comes with an operating temperature of 10 to 30-degree C. These printers are compatible with all Widows, Mac and Linux operating systems. Created by Canon, one of the leading computer peripheral manufacturers in India, it has a high recovery speed. The printer has a high printer and copy speed. They come with a high poster, watermark, page composer and toner saver. 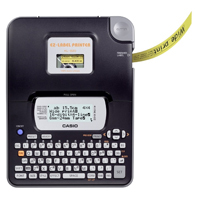 Casio printers that are available at Moglix are equipped with a qwerty keyboard and have a high print height. Some models of Casio printers which we are offering come with a 12 digit display and an ABCD keyboard as well. The Samsung printers which are available at Moglix comply with different versions of Windows and Linux operating systems. 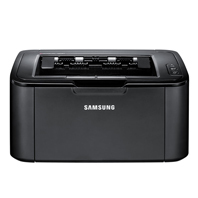 Our Samsung printers come with a maximum monthly cycle of 15000 pages. They use print languages such as PCL6, PCL5e and SPL. Our range of a non-condensing relative technology and have a high and relative humidity. They have the duty cycle to produce up to 20,000 images per month. They are equipped with two-sided manual output. The Xerox printers have a standard paper capacity of 350 sheets and a maximum paper capacity of 850 sheets. Panasonic printers which we offer have a wide range of features such as USB connectivity, automatic document feeder, 26 PPM simplex and 24 PPM duplex. 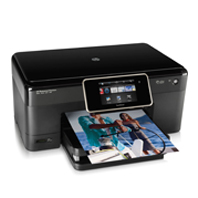 The HP printers that are available at Moglix come with a first copy out time of 8-24 seconds. Created with a high period level of precision by HP, one of the world’s leading producers of computer peripherals, they have varying black print speeds. 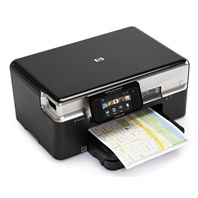 The HP Officejet printers are ideal for domestic use. It has the capacity to print up to 14 pages per minute. It can be connected wirelessly with all devices such as smartphones, tablets and PCs. These printers offer laser quality text and offers bright colour to all documents and projects. They are simple, easy to use and highly powerful. How to Select the Best Printers? Quite a few personal printers and business printers have small displays on their front panels to help you choose menu options or for communicate printer status. Though the typical display can include one or two lies of character based messages, higher -end and photo oriented printers can have a full-colour LCD with touch capability. Normally it is better to have any type of display, rather than mysterious, blinking lights. 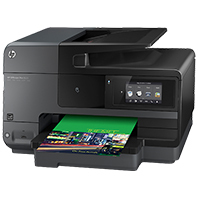 The Samsung printers which we have as a part of our collection have a speed of 43 ppm and consume a limited amount of power. Normally, both inkjet and laser printers print on letter and legal size paper. They come with input and output trays which can hold at least 100 sheets of paper. Printers with manifold paper trays can hold far more pages, which will help in reducing the frequency of tray refilling. There are a number of ways that printers can move through the feed. A number of them draw paper from the printer’s front using rubber rollers for guiding the paper out of the tray though the printer. In contrast, top-load printers use gravity for moving the paper down through the feeder and out from the printer’s front. This is a good option if you are sure that you will be printing on stiff media or other types of paper which cannot be bent. They have a high resolution of 4800x60 DPI effective. While shopping for a printer, you might come across some terms which indicate output speed. PPM (pages per minute) sometimes called CPM (copies per minute), decides how many pages per minute your printer can thrust. The higher the number of pages printed, the faster the print can copy or print your document. If you are shopping for a photo printer, you will come across the term IPM (images per minute) which goes by the same principle. 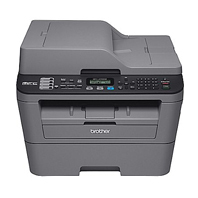 Our range of Xerox printers have a high printer speed. They come with interesting features such as booklet printing, 256-bit payscale, mixed documents, watermarks, poster printing, N-up etc. They can scan through file formats such as BMP, PDF and TIFF. They can scan to PC and TWAIN applications. On the other hand, Samsung mono laser printers have a first print rate of less than 8.5 seconds. These printers come with a maximum duty cycle of 15000 printers. 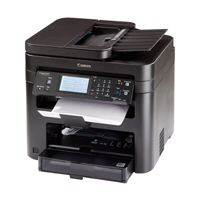 We are also offering Canon printers that have a high speed of printing and are equipped with a high speed cartridge. Some models have a copy speed of 12 seconds. Each time you require opening the computer for maintenance, turn off its power. Keep your hands away from hot fusers and moving within the printer. It will ensure that neither you or your printer suffer from any type of damage. The build-up of toner, dust and other debris within the printer might lead to jams, causing streaks of ink to appear on papers. A proper fix is to remove particles using a small vacuum. It is preferred over use of canned air dusters since it removes dust instead of spraying it around its interiors. You can still go further by using a cotton swab and pure water to wash and cleanse the ink cartridges. Most of the manufacturers offer specific instructions either in their printer manual or online. Make it a point to read them since there are some parts of the cartridge which you didn’t gauze. Like other peripherals, your printer will last longer if you take its proper care. A mistakenly resolved paper jam might lead to printing problems in the future. Instead of venting your frustration on the printer, use the instructions which come with the printer to find out the best way to fix a jam on your specific model. Usually, the most common practice is to utilise both hands in order to pull out the jammed paper slowly. It will help you ensure that there is no internal damage to the printer. You can also check jams by ensuring that the paper you load within the printer isn’t torn, stuck together and dog eared and that the tray isn’t overfilled. If you are willing to invest a little amount of money to extend your printer’s lifespan, buy a maintenance kit from the printer’s manufacturer when the original parts start showing signs of wear out. The kit will include a wide range of maintenance products ranging from cleaning supplies to changeable printer parts like rollers, which when dirty or worn out are the major cause of printer jams. No printer is flawless and there can be occasional jams, errors and smudges. However, easy printer maintenance it is possible to minimise the recurrence of these issues and ensure a better printing experience. Why Buy Printers from Moglix? 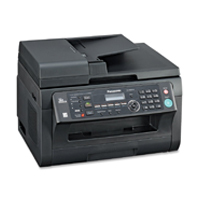 At Moglix, we deal in a wide range of office machines like printers, Shredders, Fax Machines, Paper Trimmers etc sourced from leading brands such as HP, Samsung Xerox, Canon, Brother, Kavinstar, Panasonic etc. The printers which are sourced by us are subjected to numerous quality checks to ensure that buyers are satisfied with their quality. Moglix has built partnerships with numerous suppliers both within India and abroad. 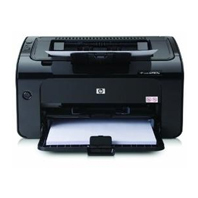 We have kept the printer price within a wide rage to fit the budget of both home as well as office based buyers. Come, choose from the assortment of printers offered by Moglix.